Energy transmission from the comfort of your couch! What is an energy transmission? 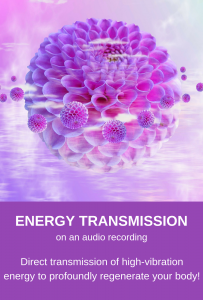 Instructions for accessing the energy transmission audio recording on the VIMEO platform. If you already have a VIMEO account, log in. If you don’t have an account yet, register. Registration is free. Click the link next to the Energy Transmission video recording or the upper-right button in the video recording, where the word “rent” and the price “€ 33” appear. The recording will be available for 1 week. You can listen to it as many times as you want during that week. Select your method of payment. You can pay via PayPal or by credit card. What is an energy transmission, how is it performed, what can you feel? 1. Make sure you won’t be disturbed as you listen to the recording. Lie down somewhere, close your eyes and listen until the recording ends, keeping your eyes closed all the time. This allows the energy to work with you on deeper levels. 2. In your mind, ask the energy to support you where you most need support at the moment. This will be your intention. 3. The recording starts and ends with music, whereas the energy transmission occurs in silence. Silence is not a mistake! It encourages you to focus your attention on yourself and observe what is happening with your body, thoughts and emotions. Inner silence is a natural state of the conscious mind, yet in a world of never ending stimuli we are no longer used to it and, at the beginning, it may even be stressful. 5. Always listen to the recording until the end, regardless of what may be going on inside you. Please persist even if you don’t feel anything special. Only in this way can the process be completed. 6. When you finish listening, drink a glass of water. On the day you listen to the recording, avoid drinking alcohol before and after. What can you feel during an energy transmission? 10. How do I listen to an e-transmission (audio recording)? In your mind, ask the energy to support you where you need support. This is your intention. Your intention can be anything you wish to resolve, abandon, heal or change. You can ask for body regeneration or even support in self-healing. You can ask for the transformation of any emotional burdens, the resolving of unhealthy relationships with any person or with yourself, your attitude to health, money or a certain partnership. You can ask for help in letting go of your limiting beliefs, destructive behaviour or bad habits. You can ask for support in introducing changes, overcoming challenges or exploring new opportunities. Before you start listening to the recording, lie down somewhere comfortable and make sure you won’t be disturbed – especially by your phone. Close your eyes and relax. Take a few deep breaths and connect with yourself. After you express your intentions in your mind, just relax and listen to the recording. It starts with a short piece of music to help you relax and it also ends with music. In the meantime, the energy transmission occurs in silence. While listening to the recording, keep your eyes closed throughout as this will allow you to go deeper within and the energies to work more profoundly. Transmission takes place in expanded consciousness, which is why during that time your perception of space and time may be altered. You might have the feeling it lasted only a few minutes or half a day. No matter what goes on, listen to the recording until the very end so that the process is completed. The recording is universal, but will affect you in the way that benefits you the most at the time. This means that listening to the same recording today and then after a few time will be two totally different experiences.